Majestic North American elk are known for producing high-pitched, screeching calls that carry for kilometres, particularly during breeding season. Known as "bugling", it sounds for all the world like the piercing shrieks of the Ringwraiths from Lord of the Rings. This has puzzled scientists, because the pitch of an animal's call in the wild usually depends on its size. 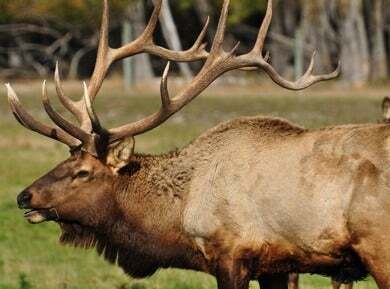 Larger animals like the elk, or wapiti, should have calls that fall into deeper registers, simply because they have larger larynges that vibrate at lower frequencies. "Their pitch is totally unexpected," David Reby, of the University of Sussex, told Gizmodo. So he collaborated with several colleagues from diverse disciplines to investigate further. They just published their findings in the Journal of Experimental Biology. When they analysed recordings of bellowing deer in New Zealand, Reby et al found that the wapiti actually have two distinct frequencies in their calls: that blood-curdling Ringwraith scream, clocking in as high as 4000 Hz, and a much lower pitched sound of around 150 Hz. We tend to only hear the former, since those sounds travel greater distances. Further analysis showed that the two sounds are produced independently. The vocal cords vibrate to produce the lower-pitched call, in keeping with the animal's large size. As for that high-pitched whistling shriek, they concluded that the deer blow air from the glottis (the opening between vocal cords in the throat) through the nasal cavities — much like how air vibrates as it moves through a flute. Reby hopes to run experiments using actual wapiti larynges taken from deceased animals to further test this hypothesis. It's a fairly common practice: in 2006, for instance, the University of Iowa's Ingo Titze mounted a Siberian tiger larynx — the tiger had died of natural causes — on a lab bench and took CT scans of the resulting movements as air was pushed through the structure. Similar experiments could help Reby and his colleagues learn more about the inner workings of the wapiti larynx and vocal cords in action. The next step, according to Reby, is to explore what information is being encoded (and hence conveyed) in the various components of the wapiti's vocal repertoire. So they will be collecting bugle recordings from a broader sample of animals. "If we find that the higher the whistle, the larger the animal, then we can play back bugles with re-synthesised whistle components, mimicking small versus large animals, and see how they react," he said.